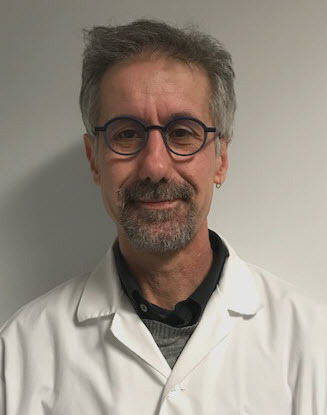 The overarching mission of the Experimental Pathology Unit (EPU) is the establishment of a bidirectional approach to biomedical discovery by translating basic science into clinical practice, and utilizing clinical observations to develop novel hypotheses to be tested in the research laboratory, aiming to improve human health by understanding the basis of disease and building bridges between biomedical scientists in the Faculty of Medicine and clinical specialists in the Health Care Services. The EPU strengthens the philosophy of integration and collaboration between members of the Department of Pathology as well as associate members from other departments in the Faculty of Medicine who share common research niches, by optimizing the use of available technology, research platforms, instrumentation, and research applications. The EPU takes advantage of the uniqueness of the discipline of Pathology, historically based on the gross and microscopic analysis of tissues and currently expanding the knowledge of cell and molecular biology. Pathology constitutes an ideal foundation for linking basic and clinical scientific research with clinical practice and nurturing the formation of multidisciplinary work groups. The main goal of the EPU is to expand our understanding of all aspects of disease, from gross anatomy to the molecular roots, thus contributing to the betterment of patient diagnoses and treatments while training the next cadre of health professionals and educators. The research program covers a wide variety of pathologies with a special emphasis on high fatality diseases. 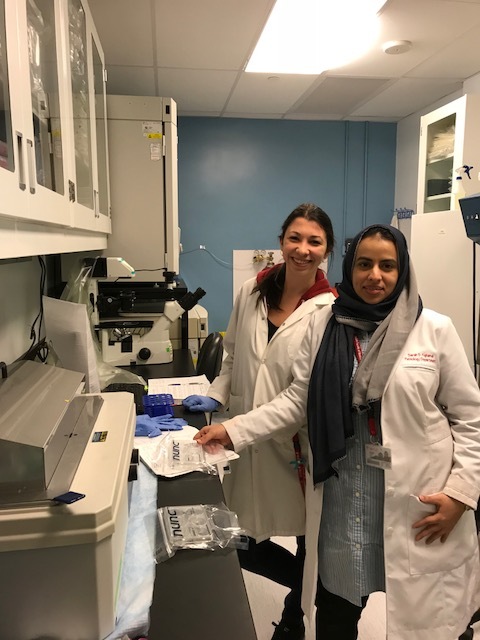 The EPU is closely intertwined with the Graduate Studies Program in Pathology that has an integrative and comprehensive focus on organismal biology and pathology while imparting scientific rigor in training our diverse group of students following a team-based mentoring approach. The laboratory is equipped with facilities for routine histology and immunohistochemistry, imaging, laser microdissection, cell culture, western blotting and other molecular testing. Cellular differentiation and lineage specification are not unidirectional processes, as once believed, but rather can take on multiple courses depending on the biological context. Highly specialized cells, for example, can dedifferentiate in vitro and in vivo to take on characteristics of stem-like cells or trans-differentiate into other cell types. Furthermore, stem cells can be reprogramed using certain environmental cues to alter their proliferative or differentiation potential. These phenomena, referred to as cellular plasticity, are particularly relevant to our understanding of how tissues regenerate following injury and how cancer cells evade drug treatments. The epithelium of the gastro-intestinal tract is an ideal model for studying the molecular mechanisms driving cellular plasticity. One of the extraordinary features of the gut epithelium is its capacity to continuously self-renew and quickly regenerate following injury. These processes are driven by intestinal stem cells (ISCs), which are in turn regulated by a number of developmental signaling pathways such as Wnt, Hippo, Notch, BMP etc. 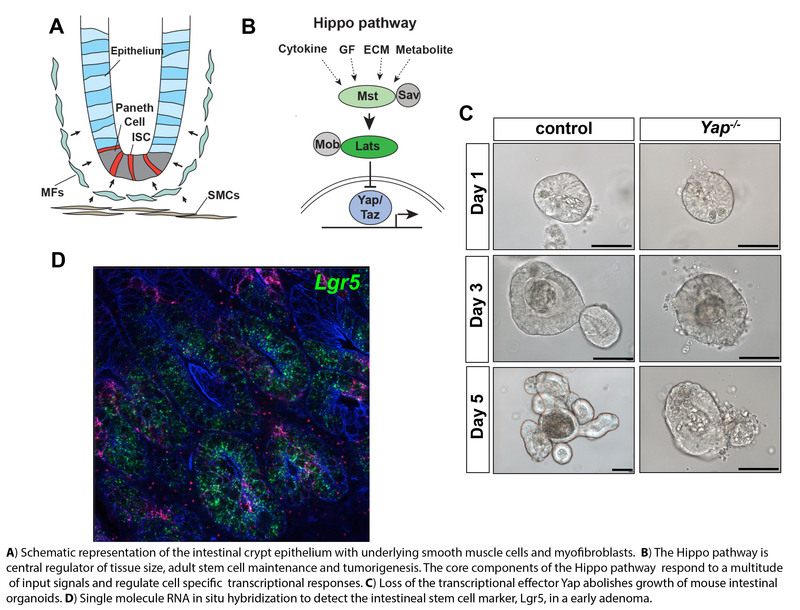 In the lab, we are particularly interested in dissecting the role of the Hippo pathway and its transcriptional effectors Yap and Taz in reprogramming ISCs during gut regeneration. Moreover the lab is also focused on studying the role of these factors in cancer stem populations during colorectal cancer. Tumor growth and dissemination is dependent on the inherent proliferative capacity of cancer cells. Through an evolutionary process cancer cells accumulate mutations, which fuel their growth and migratory potential. However, expansion of tumor cells is not entirely an autonomous process. Indeed, cancer cells strongly depend on normal host cells for nutrient uptake, oxygen consumption and growth factor stimulation. Amongst the wide variety of cell types, which compose the tumor microenvironment, fibroblasts are considered key regulators of cancer growth. Fibroblasts are highly abundant cells that establish the structural framework or extracellular matrix onto which organs are built during embryogenesis and maintained throughout life. Importantly, fibroblasts also orchestrate wound-healing responses after injury, a process, which is often coopted during cancer. Over the past 10 years, Dr. Haegert’s laboratory has focused on alterations in naive T-cell homeostasis in patients with multiple sclerosis (MS). His laboratory found that patients with both relapsing-remitting MS (RRMS) and primary progressive MS (PPMS) have early thymic involution with reduced thymic output of naive T-cells including recent thymic emigrants. More recent work indicates for the first time that early thymic involution leads to a homeostatic peripheral naive T-cell proliferative response. This finding has potential relevance to MS pathogenesis, as homeostatic proliferation is implicated in autoimmunity in experimental animal models and in the development of autoimmunity in humans. More recent work used whole genome microarray studies to analyze isolated naive CD4 T-cells from patients with secondary progressive MS (SPMS). Unexpectedly, unbiased hierarchical clustering segregated patients with SPMS into two groups, one group, termed SP-1, having a short RRMS duration and one group, termed SP-2, having a long RRMS duration. SP-1 patients upregulated numerous genes involved in immune activation compared to healthy controls and SP-2 patients. Subsequent analysis identified a list of 130 T-cell activation genes that also separated SP-1 patients from healthy controls and SP-2 patients. This gene list was reduced to 3 genes which similarly separated SP-1 from controls and SP-2. The specificity of these 3 genes for SP-1 patients was confirmed at the protein expression level and in T-cell activation experiments. Since SP-1 patients had a significantly shorter RRMS duration that SP-2 patients (mean of 12 vs. 24 years), the 3-gene signature is a possible biomarker (at mRNA and protein express levels) that identifies patients having rapid transition from RRMS to SPMS. Current studies in the laboratory focus on the 3-gene sig nature as a putative biomarker signature predicting disease progression in patients with progressive MS. This signature is being investigated in two ways. Firstly, the signature is being evaluated by flow cytometry in patients treated with FTY 720 (Gilenya) in order to determine whether expression of this signature on one or more CD4 T-subsets (naive, central memory, effector memory and TEMRA cells) predicts either response to treatment or disease progression or both. Secondly, the signature is being evaluated in patients with progressive MS (both SPMS and PPMS) to determine whether expression of this signature on one or more CD4 T-subsets changes over time and whether increased expression of this signature distinguishes between patients who have rapid vs. slow MS progression. Assessment of MS progression involves collaboration with expert neurologists and neuroradiologists and includes evaluation by clinical parameters, including the Expanded Disability Status Scale or EDSS and MRI parameters that assess atrophy and inflammation within the CNS. The list of 130 genes having increased expression in naive CD4 T-cells from SP-1 patients includes various genes that were not previously evaluated at either the protein expression or functional level. Some of these molecules will be further evaluated in patients with progressive MS at the mRNA and protein expression levels, both before and after T-cell activation. The long term goal of this work is to develop a convenient biomarker signature that predicts rates of MS progression and potential responses to treatment. The primary research interest in Dr. Telleria’s laboratory is in the field of ovarian cancer biology and preclinical therapy. Ovarian cancer is the deadliest gynecologic malignancy in developed countries. The 5-year average survival rate for these patients is <40% and has not improved since the introduction, more than 30 years ago, of platinum (Pt)-based chemotherapy following debulking surgery. This is because 70% of patients are diagnosed with advanced disease as early signs and symptoms are difficult to recognise. Pilot programs to guide early diagnosis associated with low-volume resectable disease are beginning to evolve yet much work lies ahead before predictive screening tests reach the clinic. Most patients diagnosed with the disease have numerous tumoral masses within the abdominal cavity making debulking surgery a difficult task. If optimal debulking surgery is achieved—meaning that no macroscopic disease remains—and the patient completes 6 cycles of Pt-based chemotherapy, the standard responder still recurs within 16-24 months, rarely responds to a second round of Pt-based therapy, and poorly responds to alternative cytotoxic drugs, eventually succumbing to the disease. While these patients are clinically in remission, they do not receive any maintenance therapy; this time-frame is a missing opportunity to intervene with a low toxic therapeutic approach to prevent residual cellular clones escaping Pt toxicity to timely grow back into sizable tumors. Thus, the long term goal in our laboratory is to develop a maintenance therapeutic approach to be offered to patients diagnosed with ovarian cancer after they recover from debulking surgery and the subsequent cycles of chemotherapy, to maintain residual ovarian cancer cells, which had escaped initial therapy, in a non-proliferative or dormant status, keeping the disease in remission.
. A macroscopic human ovarian cancer tumor growing in the abdominal area of an immunosuppressed female mouse depicts two distinct histological patterns: (i) diffuse solid pattern (A, D, G); and (ii) papillary, showing irregular slit-like spaces (B,E, H at lower magnification; C, F, I at higher magnification). Tumors express mutant p53 and, in particular, express CA125 in cells bordering the slit-like spaces. Scar bar = 50 mm. L: liver; Tu: tumor; Sto: stomach. H&E: hematoxylin and eosin staining. Ovarian Cancer Multicellular Structures. This research proposal is to assess the tumorigenic capacity of ovarian cancer cells that arrange as multicellular structures free-floating in the abdominal cavity. As these multicellular structures seem to be active mediators of ovarian cancer evolution, development of therapeutic interventions to interrupt their formation may be an efficient tool to interject disease progression. 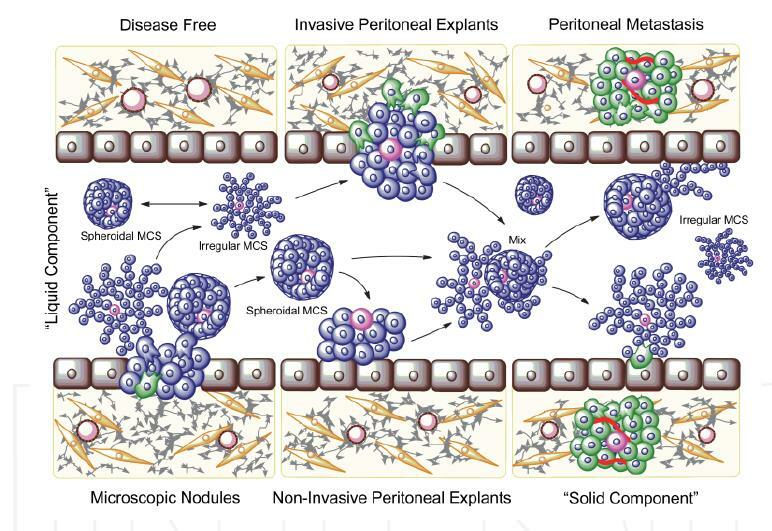 Proposed model for the role of ovarian cancer multicellular structures (MCS) in peritoneal carcinomatosis. Selected cells from microscopic nodules with distinctive capacity to form MCS, adapt, survive, and grow in the peritoneal fluid developing irregular and organized spheroidal MCS that might evade chemotherapy and/or preserve ovarian cancer initiating cells (CIC), leading to a feed-forward, chemo-resistant, and self-renewal recurrent seeding. MCS committed to develop the solid component of the disease will adhere, disaggregate, migrate, and invade the mesothelial cell layer covering the surface of the peritoneum (maroon), and form foci that neo-vascularize and grow (green). Other MCS might develop non-invasive nodules that amplify the cellularity within the “liquid” compartment causing ascites. 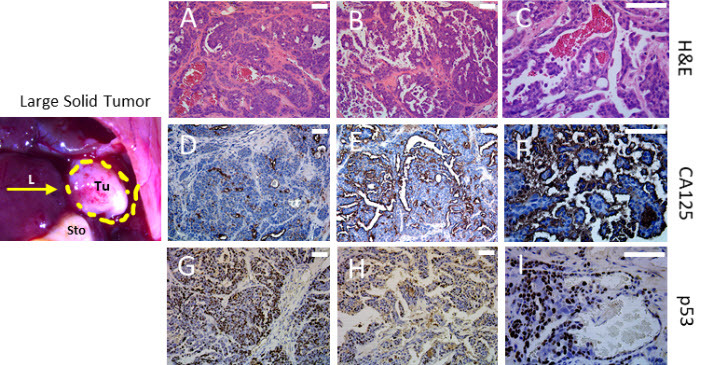 Blue: highly differentiated ovarian cancer cells. Pink: less differentiated cancer cells with self-renewal capacity. Red: new blood vessels. Gray: extracellular matrix. Yellow: fibroblasts. Peritoneal Ovarian Cancer Dormancy. 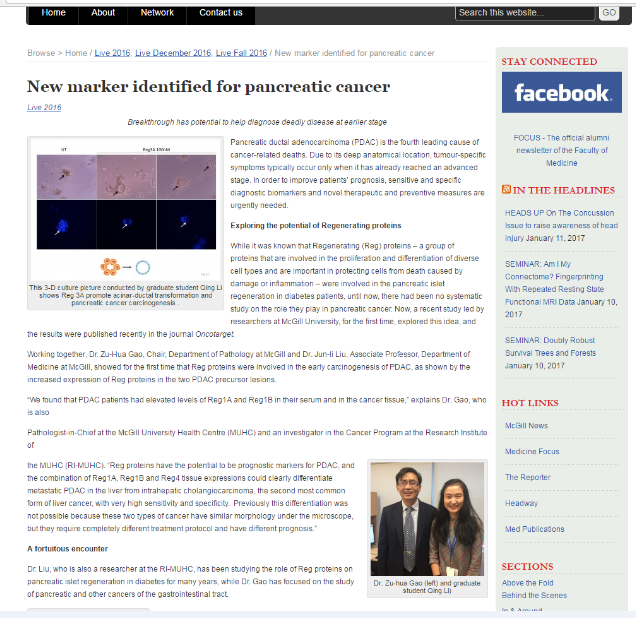 This project aims at identifying where the disease hides within the peritoneal cavity in a dormant state after ‘successful’ front line surgery and chemotherapy, and studying the molecular drivers of cellular dormancy. Knowing the molecular network, the cells set in motion to drive the process of dormancy and the subsequent awakening period, we hope to find an Achilles' heel of the process in which a medical intervention can be attained, to either extend the dormant state, and, consequently, the progression free survival following front line standard of care, or, instead, prevent the awakening process when cells grow back into sizable tumors that make the patient sick again. 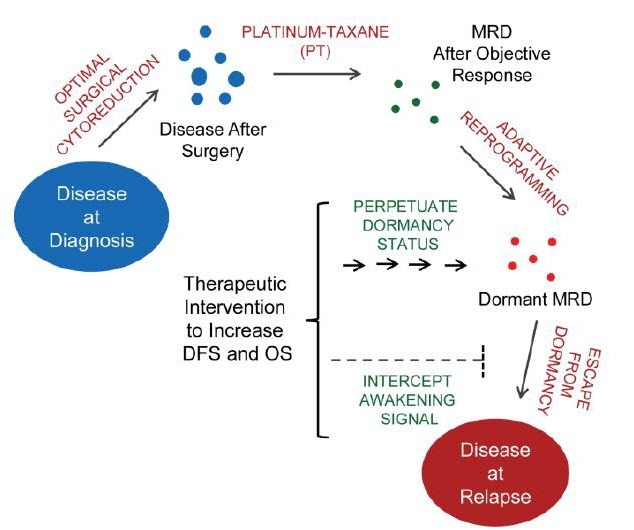 Total elimination of ovarian cancer cells is the ideal goal, yet the alternative of developing a therapy that keeps ovarian cancer in a chronic dormant state is relevant as patients would have a chronic manageable asymptomatic disease or ‘cancer without disease.’ Hypothetical model of ovarian cancer dormancy after debulking surgery and platinum-taxane (PT) therapy, relapse after chemotherapy-associated dormancy, and potential stages of the disease where therapeutic intervention is envisioned. DFS, disease free survival; OS, overall survival; MRD, minimal residual disease. Proteotoxic Stress: Target of Ovarian Cancer? 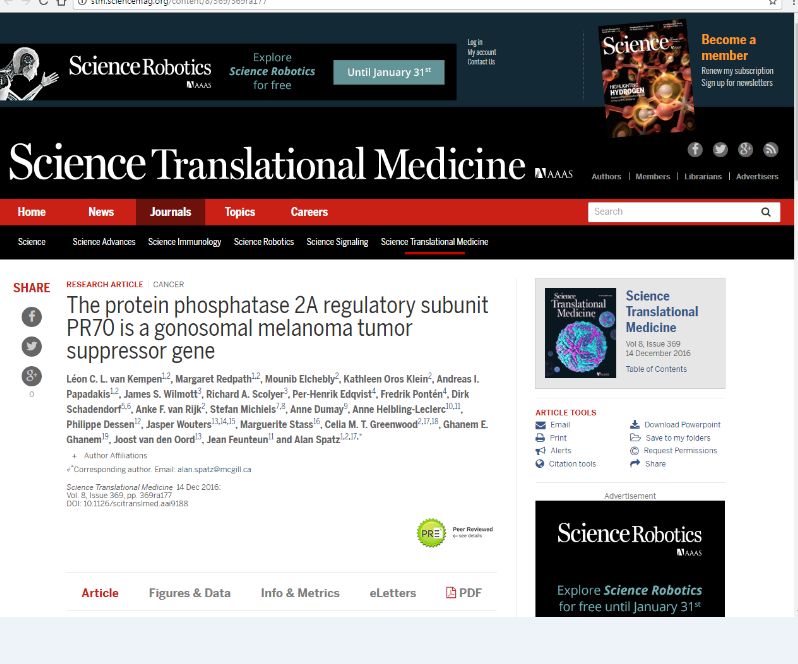 Because cancer cells in general and ovarian cancer cells in particular have high metabolic rate, including elevated protein synthesis, folding, and degradation, the intracellular organelles and macromolecular systems in charge of regulating protein homeostasis, such as the endoplasmic reticulum (ER) and the proteasome, operate under constant stress; this provides an opportunity for developing novel therapeutic approaches leading to protein intoxication or proteotoxicity of the ovarian cancer cells that would allow killing the cells that had escaped initial chemotherapy but are not dividing or recurring. One such approach under evaluation is the use of drugs that sensitize ovarian cancer cells to the toxicity of proteasome inhibition by causing sufficient ER stress to tipping cell fate toward ER-mediated cell death. Schematic model whereby endoplasmic reticulum (ER) stress aggravation triggered by the antiprogestin mifepristone (MF) (B) is potentiated by either proteasome inhibition (C) or lysosomal inhibition (A) leading to cell death. 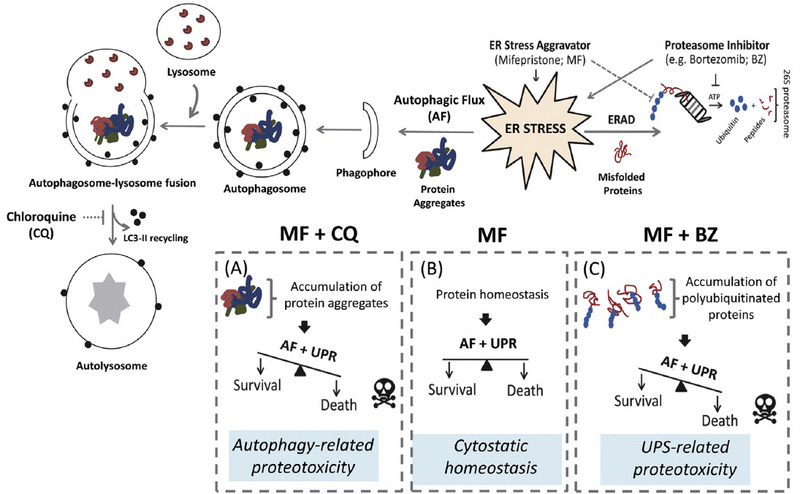 AF: autophagic flux; ERAD: ER associated degradation; UPR: unfolded protein response; UPS: ubiquitin proteasome system; CQ: chloroquine; BZ: bortezomib. Drug Repurposing. The focus of this investigation is to create strategies for repurposing or repositioning compounds originally developed for reproductive medicine (e.g. antiprogestins) or HIV treatment (e.g. HIV inhibitors), to treat ovarian cancer in conjunction with standard chemotherapy. Dr. Telleria’s laboratory demonstrated that these compounds are potent blockers of ovarian cancer cell growth. The ultimate objective is to contribute with a therapeutic approach to convert ovarian cancer into a treatable chronic disease. Uterine Hyperplasia and Polycystic Ovarian Syndrome. Polycystic Ovary Syndrome (PCOS) is a common endocrine system disorder occurring among women of reproductive age. The syndrome is defined by oligo or anovulation, ovarian cysts and/or hyperandrogenism. It is also associated with several conditions such as insulin resistance, metabolic syndrome, obesity, type 2 diabetes, heart disease, mood disorders, inflammation, infertility, and predisposition to uterine cancer. 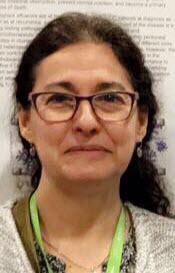 This project, in collaboration with Dr. Motta from the University of Buenos Aires, Argentina, uses a PCOS murine model to investigate whether the animals are prone to develop initial traits of uterine hyperplasia that may explain the high correlation found in patients having PCOS that later on develop uterine cancer. Endometriosis and Ovarian Pathophysiology. Endometriosis is a chronic, inflammatory disease defined by the identification of endometrial tissue outside the uterus. In this project, in collaboration with Dr. Casais from the University of San Luis, Argentina, we study the proliferative capacity of ovarian tissue and endometrial lesions in wildtype and TNFRp55 knockout mice. The project intends to link a potential origin of ovarian cancer in patients with preceding endometriosis. Sarah Alghamdi, MBBS, MSc Candidate. Sarah’s research involves the recreation of peritoneal ovarian cancer disease in immunosuppressed mice. She is a native of Saudi Arabia. Robert Dube, BSc, MSc Candidate. 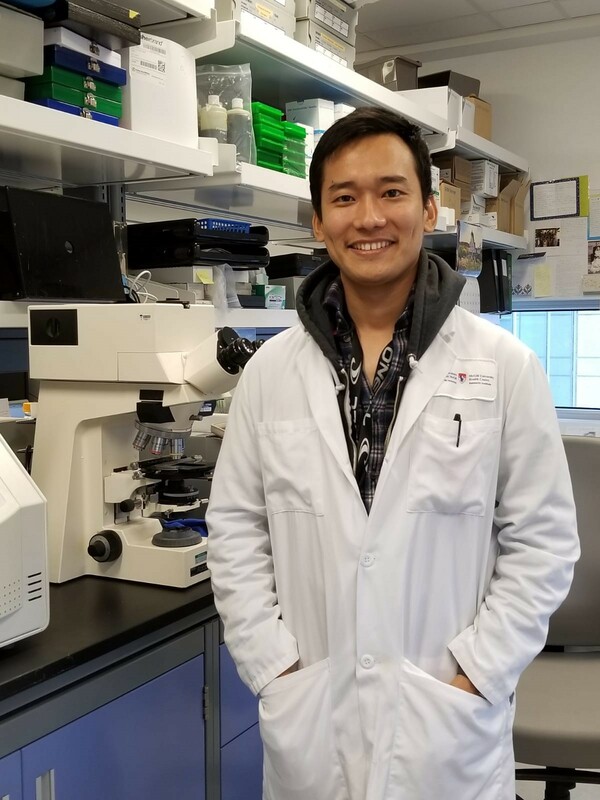 A McGill graduate, Robert’s research deals with investigating the potential utilization of novel anti-glucocorticoid agents not having anti-progestational activity, for the treatment of ovarian cancer. Rob is a native of Montreal. Silvana Ferreira, BSc, PhD Candidate. Silvana is pursuing her doctorate from the University of Buenos Aires with the Co-Direction of Dr. Telleria here at McGill University. She shares research time in Argentina and Montreal. 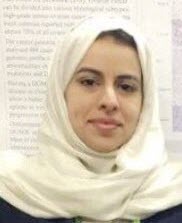 Her project revolves around the study of uterine hyperplasia associated with Polycystic Ovarian Syndrome (PCOS) using an animal model of disease. Alicia Goyeneche, PhD. Researcher. 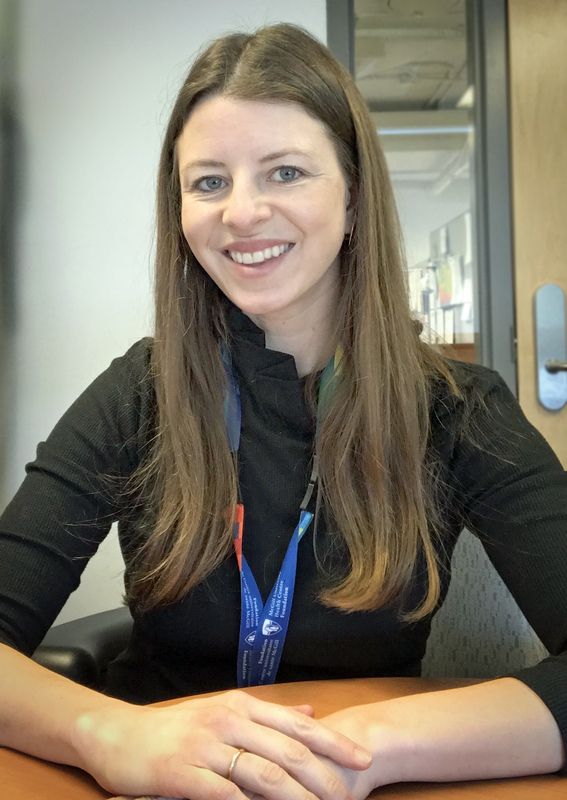 Alicia’s research focus on understanding the pathobiology of multicellular structures that free-float in the peritoneal cavity of patients with advanced ovarian cancer. She has a strong training in cancer biology and laboratory medicine. She obtained her PhD in her native country, Argentina. 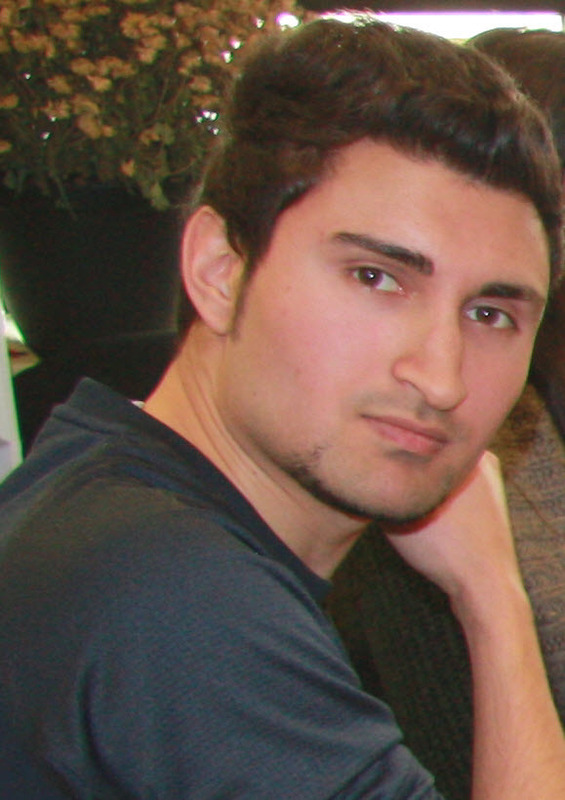 Michael Licio, BSc, MSc Candidate. A McGill graduate, Michael’s research focuses on the study of the clonal evolution of ovarian cancer. He is a native of Montreal. Sabrina Ritch, BSc, PhD Candidate. 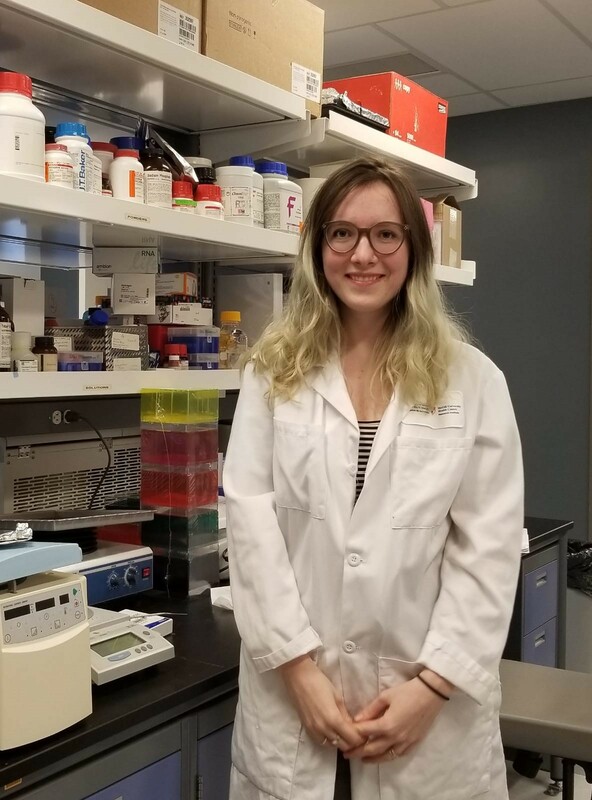 A McGill Graduate, Sabrina’s research is geared towards the investigation of the migratory and invasive capabilities of high-grade serous ovarian cancer cells along disease progression and the potential treatment with antiprogestins. She is a native of Montreal. Mahbuba Subeha, MBBS, MSc, PhD Candidate. 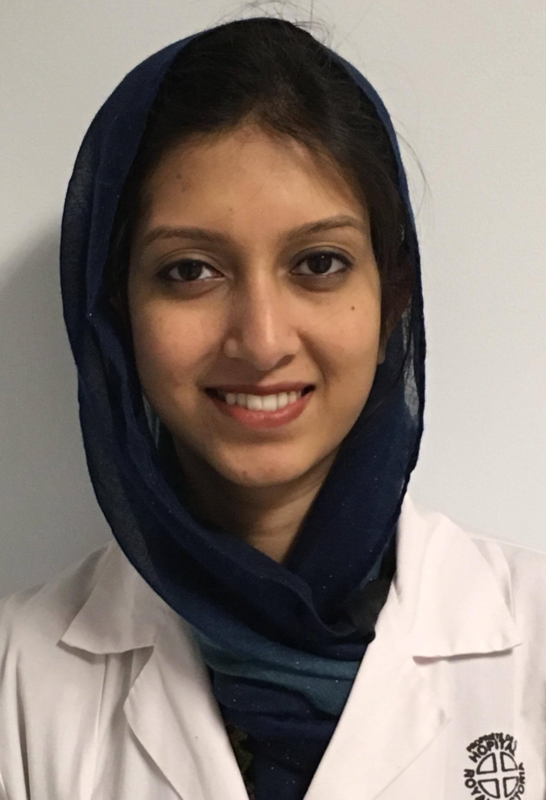 A native of Bangladesh, Mahbuba is pursuing her doctorate in experimental pathology [A person who is smiling and looking at the camera Description generated with very high confidence] investigating the potential anti-ovarian cancer efficacy of drugs usually utilized to treat HIV patients. Federica Ghersa, PhD Candidate. 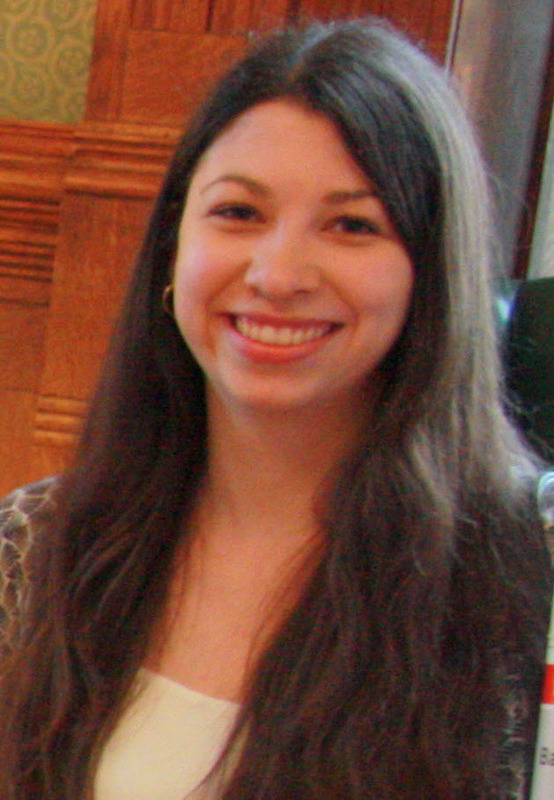 Federica is pursuing her doctorate from the University of San Luis, Argentina. 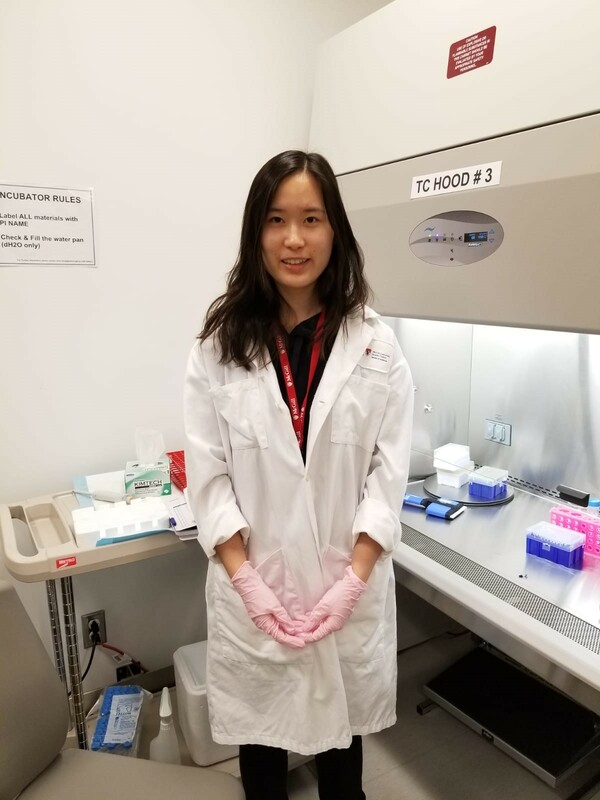 She is an exchange student that joined our laboratory with an ELAP (Emerging Leaders in the American Program) scholarship from Global Affairs Canada, to investigate the histopathological impact of endometriosis on the ovary using a mouse model of endometriosis in TNFalpha-P55 KO mice. Click here to see Dr. Telleria list of publications registered in PubMed. 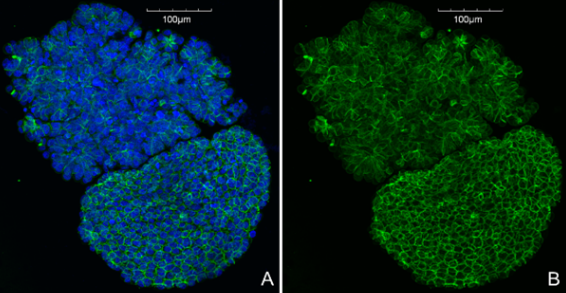 Immunofluorescence showing E-Cadherin expression in irregular and spheroidal multicellular structures (MCS) of PEO6 ovarian cancer cells after being cytocentrifuged. The green fluorescence represents E-cadherin, whereas the nuclei are stained in blue with DAPI. (A) Composite image showing the distribution of E-cadherin in the cell membrane. (B) E-cadherin expression without DAPI overlay. Green-fluorescence protein expressing A2780 ovarian cancer cells within spontaneously formed MCS free-floating in a culture dish. The upper panel shows a spheroidal MCS whereas the lower panel shows irregular MCS. MCS within peritoneal effusions proliferate, depict compact (asterisks) and hollow (arrowheads) structures as shown by inverted confocal microscopy. EDU labeling denotes cells synthesizing DNA; Green denotes expression of E-cadherin; Hoechst stains the DNA. Invasion of clear cell SKOV-3 ovarian cancer cells through a polycarbonate membrane of 8 mm and stained with phalloidin (red) to denote F-actin distribution in the cytoplasm, and SYTOX Green to denote the nuclei. The image was taken after letting the cells migrate for 24 h before fixation and staining. The Experimental Pathology Unit shared equipment and resources are to be used for collaborative experimental research. 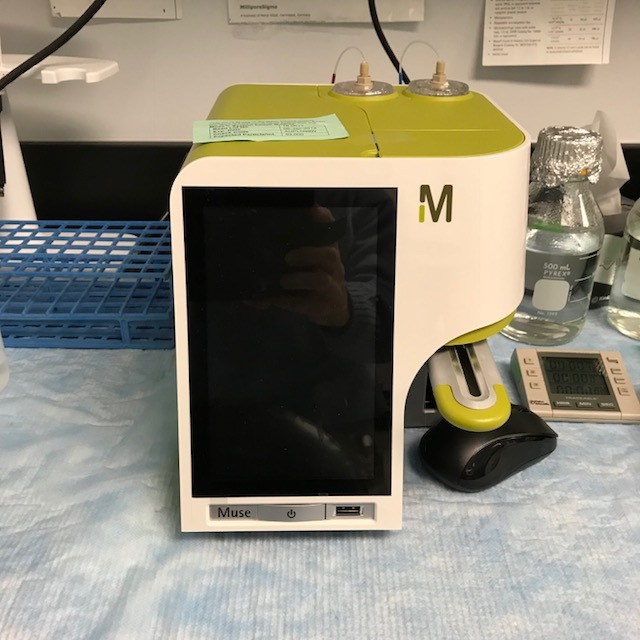 The instrumentation, know how, and specific technological approaches, are available across the McGill academic and clinical sites within the network of research laboratories that conform the Unit. Inverted fluorescence microscopic platform. Fully configurable with manual and motorized components. Allows to create high-quality images in bright field, phase contrast, or a three color fluorescence system. It includes adaptive focus control and is connected to a computer carrying an comprehensive imaging software. It can be set up for high resolution image acquisition automatically using templates for slides, dishes and multi-well plates. BSL-2 cell culture room. 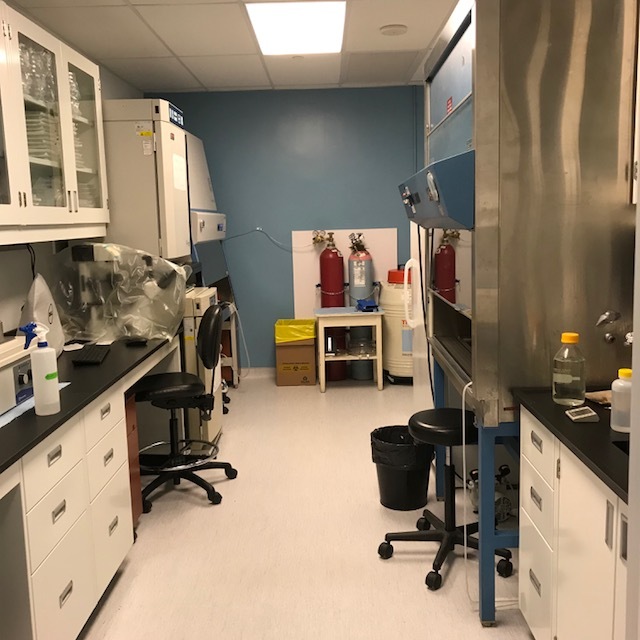 This is a state-of-the art tissue culture room supplied with a controlled flow of HEPA filtered air and washable floors, surfaces and ceiling. Includes incubators, BSL-2 cabinets, cryogenic tanks, and equipment for cell counting, viability, and phase contrast imaging. Comprehensive Western Blotting Platform. 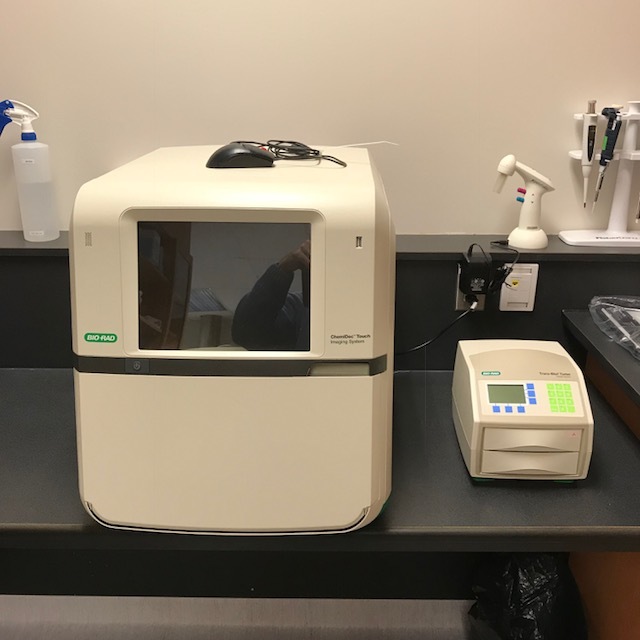 The state-of-the-art imager of the platform has three purposes: a) assess the quality of the electrophoresed proteins; b) determine the quality of the transference process from polyacrylamide gels to PVDF or nitrocellulose membranes; and c) detect chemilluminescence as a readout of relative protein abundance. The platform also includes a semi-dry transfer apparatus to transfer proteins from gels to membranes in only 7 minutes. The system allows to perform quantitative protein expression analysis. Cell Analyzer. It allows to accurately and timely counting cells, assess their viability, and other biological parameters, such as apoptosis, necrosis, cell cycle distribution, mitochondrial potential, autophagic activity, and caspase-3 activity, among several other applications. Cell imager with multi-mode microplate reader. 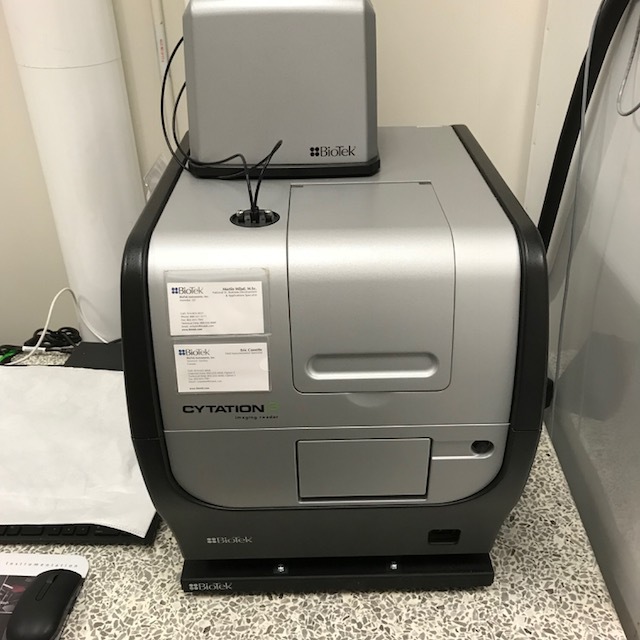 This imager combines the capacity of a microplate reader with that of an automated digital microscope with bright field and fluorescence detection capacities. It allows to obtain phenotypic cell information with quantitative data. Chronic Obstructive Pulmonary Disease (COPD) is a highly prevalent disease affecting over 300 million individuals worldwide, for which there is no available cure, representing the fifth leading cause of death. COPD is a chronic and progressive condition characterized by gradual airway obstruction, shortness of breath, cough and sputum production. The inflammation pattern is believed to induce structural cells apoptosis and tissue degradation leading to chronic bronchitis and emphysema. This research group aims to identify and understand the cellular and molecular mechanisms that control apoptosis and inflammation, two signature processes which are impaired in COPD. 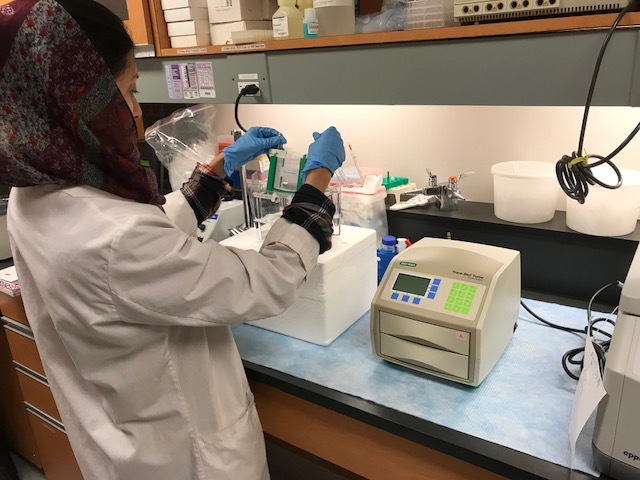 The research in Dr. Baglole's laboratory is aimed at identifying novel intracellular and molecular pathways that control the pathogenesis of chronic lung diseases associated with environmental exposures, particularly cigarette smoke. Dr. Baglole's main focus is understanding how cigarette smoke-induced inflammation and cell death (apoptosis) are regulated. Chronic and persistent inflammation and the death of lung cells are involved in the etiology of lung diseases such as chronic obstructive pulmonary disease (COPD), which is almost always caused by cigarette smoke (>90% of cases). There is no cure for individuals afflicted with COPD and there are no effective therapies that can reduce disease progression. This is due, in part, to a lack of novel intracellular targets for the development of pharmacological therapies. In this regard, her lab was the first to publish that the mere presence of a cellular receptor called the aryl hydrocarbon receptor (AhR) attenuates lung inflammation caused by cigarette smoke. This was a novel finding, as the normal physiological function of this receptor, which is best known for its ability to respond to synthetic toxicants, had not previously been described. Beyond its regulation of inflammation in the lung caused by cigarette smoke, they also investigate the role of the AhR in attenuating apoptosis, a feature that is characteristic of lung tissue destruction in COPD. 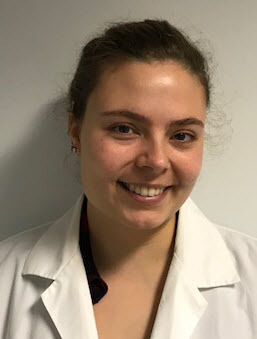 Using genetic, molecular and biochemical approaches, together with in vitro and in vivo models of smoke exposure, her research is focused on establishing that the AhR is a novel and important regulator of apoptosis and understanding in vivo, and the role of the AhR in preventing morphological features of emphysema in the lung. The advent of targeted therapies for cancer and other diseases has put molecular pathology at the center stage for clinical decision making. Analysis of germ line mutations in cancer has always been part of our molecular diagnostic laboratory portfolio. The identification of actionable driver mutations in cancer, as well as prognostic gene expression signatures have significantly changed the landscape of tumor diagnosis and the role of pathology therein. In addition to classical surgical pathology reports, a molecular pathology report is often needed to guide the most effective therapy for the individual patient. The McGill-JGH Molecular Pathology Center (MPC) opened at the end of 2013, on the 6th floor of the Segal Cancer Centre. The MPC is dedicated to clinical service, training our residents in molecular pathology, and research in biomarker discovery and validation. The Molecular Pathology group at the Jewish General Hospital provides specialized advanced analytical methods for the detection of mutations associated with various diseases, including several types of tumours. The state-of-the-art technology allows us to shift from single gene to multiplex testing for cost-effective testing, and increased security and performance. The Molecular Pathology team uses advanced technology and instrumentation, such as automated DNA extractors, targeted next-generation sequencing, real-time PCR cyclers, automated DNA sequencers, high-resolution melt-curve analyzer, High Performance Liquid Chromatography (HPLC) system, transcriptomics, and more recently a proteomics platform. 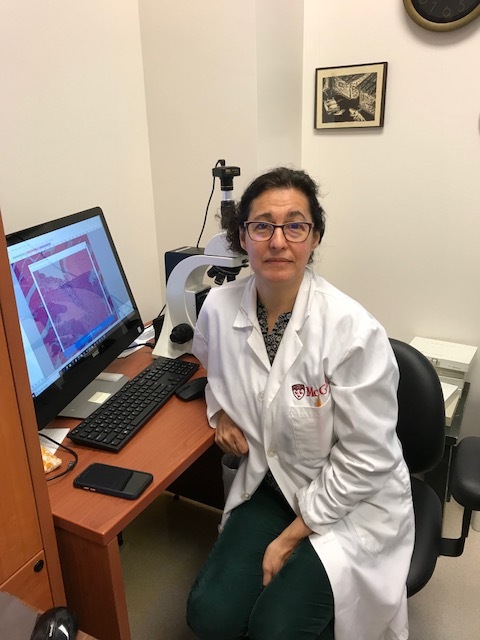 The laboratory provides molecular pathology services to the McGill network, especially to the McGill University Health Centre (MUHC) and other hospitals across the province of Quebec. 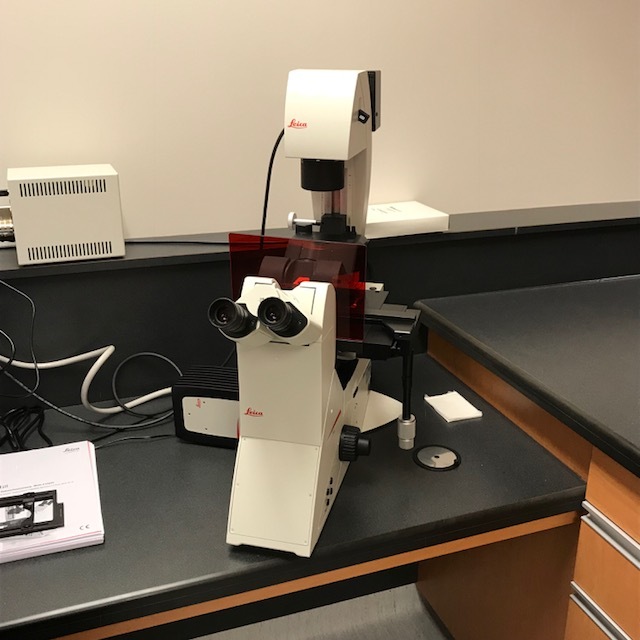 Since January 2000, the Henry C. Witelson Ocular Pathology Laboratory has been bringing together clinicians and researchers from around the world in an attempt to provide an atmosphere that is both enriching and multidisciplinary. Tasked with a triple mission of consultation, education and research, the laboratory provides consultation for patients and their doctors, as well as education, teaching and training for pathologists, oncologists, biologists, and medical and graduate students. 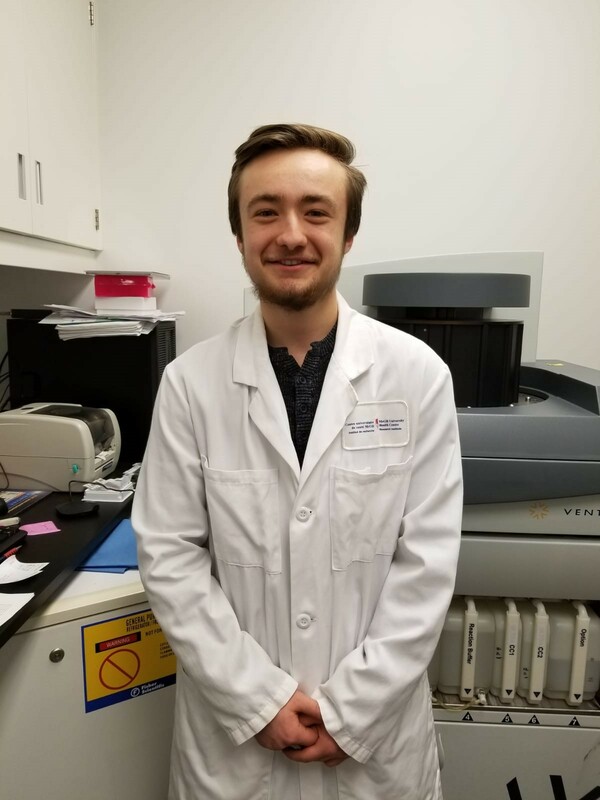 Under the direction of Dr. Miguel N. Burnier Jr., lab members work to discover the mechanisms underlying various ocular diseases including uveal melanoma, retinoblastoma, age-related macular degeneration, ocular toxoplasmosis and other clinical ocular pathologies. The union of experts from several countries and with varying medical backgrounds has provided the impetus for the laboratory’s success to date. With the addition of new experts every year, the lab strives to translate basic research findings into clinically significant treatment options for the millions of individuals afflicted with these devastating ocular diseases. The lab actively seeks out and embraces new technologies and techniques that can improve research efficiency and capabilities. Lab members frequently participate in training programs organized by external bodies in order to add to their own scientific skillsets and those of the lab as a whole. For more information on the lab, please visit the Henry C. Witelson Ocular Pathology Laboratory website. My laboratory focuses on understanding the dynamic molecular changes that occur during cancer progression and metastasis through liquid biopsy. Our ability to study tumor biology and uncover new approaches to prevent and treat cancer is limited because it relies on tissue from a biopsy, which carries several issues: inadequate sampling, rare but serious complications, and, importantly, provides one static picture of the tumor – thereby neglecting the dynamics of tumor evolution and spatiotemporal heterogeneity. To overcome these issues, my lab tracks tumor evolution through a liquid biopsy, a minimally invasive approach to monitor disease progression, recurrence and treatment response using a blood sample. Detection of circulating tumor cells, circulating tumor DNA (ctDNA) and extracellular vesicles can contribute to personalized management, and inform on the changing ‘omic status of the disease, thereby guiding therapy. Specifically we track disease development, treatment response/resistance and metastasis through detection of known and putative tumor-initiating and metastasis-promoting mutations and epigenetic changes in circulating tumor DNA. This allows us to understand the genomic and epigenomic landscape over time and how it correlates with disease course. We are currently collaborating with several clinical groups: liver metastasis, melanoma, lung cancer, and breast cancer. Thupten is working on colorectal carcinoma liver metastasis and the use of ctDNA to monitor genomic and epigenetic alterations in patient blood. Prisca has optimized an easy and cost-effective approach to detect tumor-specific mutations in liquid biopsies of ocular melanoma as a biomarker. To do this, she has validated her approach in in vitro systems, an animal model and patient blood. Tadhg uses publicly available TCGA data to perform clustering analyses of epigenetic events to identify targets that we can then detect in blood of patients. She will be testing the detection of these epigenetic changes in liquid biopsies. Alex is analysing the proteomic profile of extracellular vesicles of different melanoma cells lines using mass spectrometry.